Freak shows had been popular since the 16th century, but reached their height of popularity between the mid-19th century and early 20th century. Circus “freaks” were often people with rare genetic disorders and disabilities. Many were exploited by selfish managers, although a few did go on to become happy and rich. The performers featured here come from the heyday of freak shows. The German-born Martin Laurello (originally Emmerling) had come to the US in 1921 to perform in freak shows. 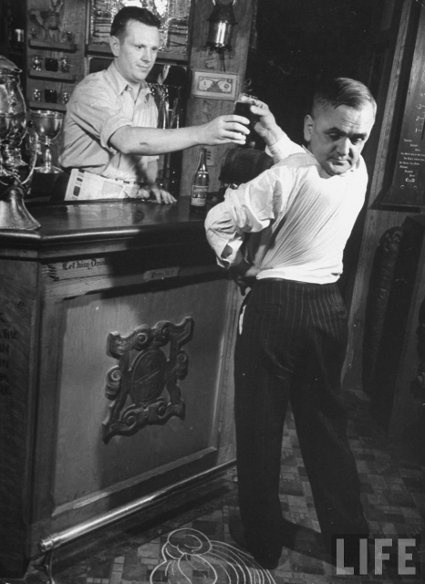 Performing under the name “The Human Owl”, Laurello could turn his head around in a 180 degree angle. 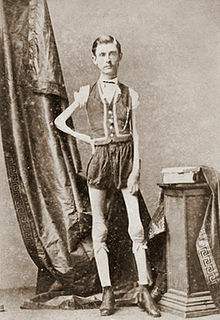 Isaac W. Sprague was an American man known as “The Living Skeleton”. At the height of 5 feet 6 inches, Sprague only weighed 43 pounds. Amazingly, he was said to have the appetite of two full-sized men. Mademoiselle Gabrielle was a Swiss woman who was born without any legs. 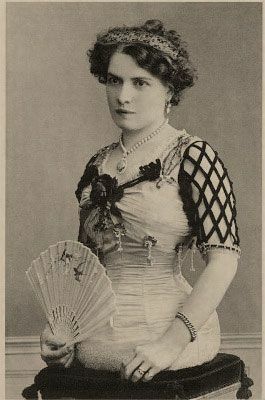 After many successful tours in America, she supposedly left the country and went back to Switzerland with her (third) husband. Pasqual Pinon toured the US for several years under the name of “The Two-Headed Mexican”. 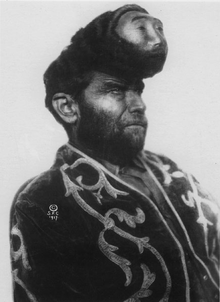 Pinon’s second “head” was actually a tumor wearing a specially-made wax face. The manager of the circus Pinon performed for later paid for the tumor’s removal. 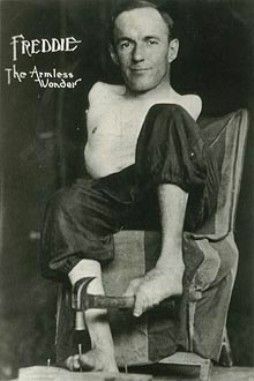 Known as “Freddie the Armless Wonder”, Frank Esele was a freak show performer who was born without arms. One of the more obscure figures on this list, Esele’s time of death is unknown, and few details exist about his personal life. Alzoria Lewis, “The Turtle Girl”, worked at Coney Island for more than 20 years between the 1930s and 1950s. Aside from her small size, Lewis was notable for her short arms and unusual feet, one of which only had one toe. 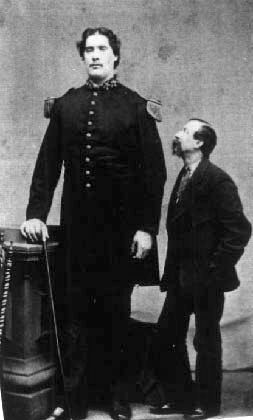 Martin Van Buren Bates was a Confederate captain who stood 7 feet, 11 inches. While touring in Europe after the Civil War, Bates married another woman of similar height, Anna Haining Swan. Bates retired from performing in the 1880s and died in Ohio in 1919. 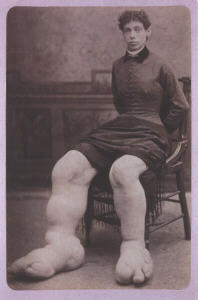 Fannie Mills suffered from Milroy Disease, a genetic disorder which causes the sufferer’s legs to become swelled with fluid. Mills’s feet were so large that she needed assistance walking. After touring for 7 years, Mills became sick and had to retire early. Minnie Woolsey suffered from Seckel syndrome, a sort of dwarfism that gives the sufferer a bird-like face and intellectual disabilities. Woolsey lacked teeth, hair, and the ability to speak comprehensively. Before working as a circus freak, she had been living in a mental asylum. George Williams started performing in freak shows while only a child. Originally, he was billed as “Turtle Boy”, but took the name “King Dodo” in later years. 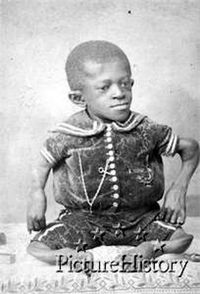 Williams was small and had twisted limbs, possibly a sufferer of parastremmatic dwarfism. 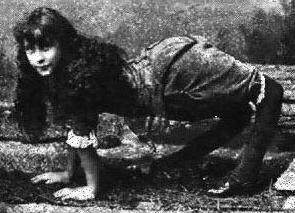 Ella Harper, “The Camel Girl”, was born with knees that could bend backwards. She walked better on all four opposed to standing up on her two feet, and that’s how she got her name. Anna Haining Swan, the wife of Martin Van Buren Bates, was just as extraordinary as her husband. 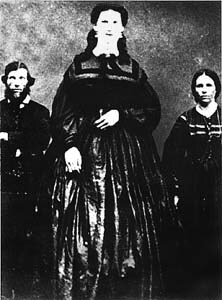 Standing at a similar height, although some believe she might have actually been taller than Bates, Swan had grown to 7 feet by the time she was 15. She was a gifted pianist and singer, and had once played the role of Lady Macbeth. 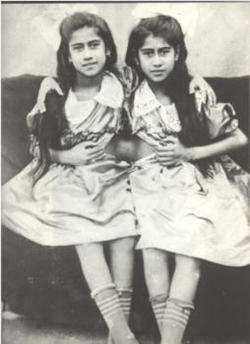 Maria and Arrita were a pair of conjoined twins who toured the US in the 1920s. Not much is known about them; they were said to have been born in Mexico, but they might have actually been born in Honduras. The girls got sick in 1929 and died shortly after. 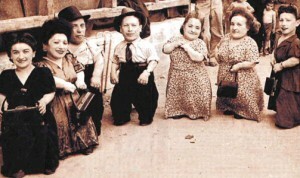 The Ovitzes were a Jewish-Romanian family of seven dwarves and five normal-sized relatives who traveled through Eastern Europe singing and playing music during the 1930s and 1940s. They were all imprisoned in Auschwitz in 1944, and despite being experimented upon by the infamous Josef Mengele, survived the ordeal and returned to Romania after the war. Betty Lou Williams was born with a parasitic twin on the right side of her body and started touring in freak shows when she was only 2-years-old. Although she died in her early 20s, Williams was such a successful performer that she was able to pay for college educations for all 12 of her siblings. 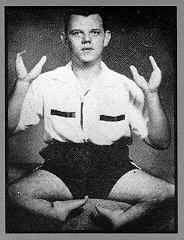 Grady Stiles, “The Lobster Boy”, lived such a bizarre and fascinating life that he was the subject of a 1994 book by former New York Times columnist Fred Rosen. Stiles had conjoined toes and fingers, which made them look like claws. He was an abusive alcoholic feared by his family for a violent temper. In 1978, Stiles fatally shot his daughter’s fiance. Although he was convicted of the murder, he was let go because no prison could have cared for his needs. 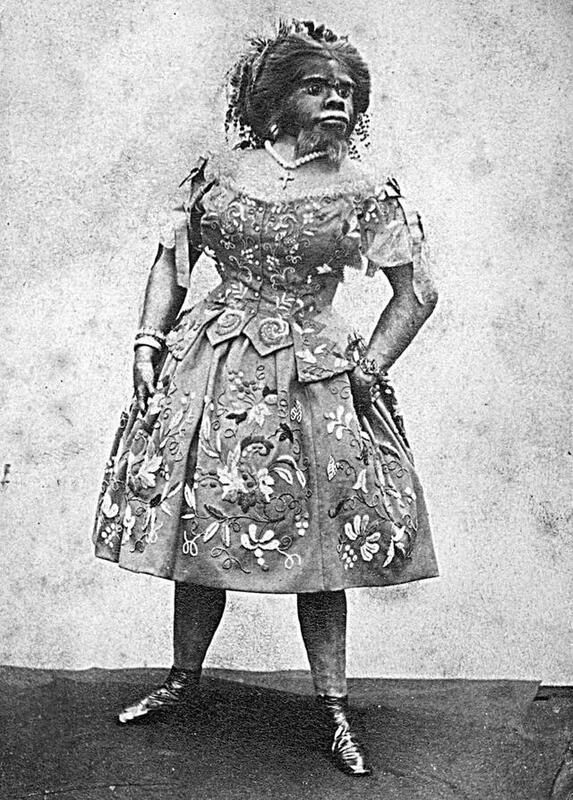 Julia Pastrana was an indigenous Mexican woman who suffered from hypertrichosis, also known as werewolf syndrome. She was an accomplished dancer, and could speak several different languages. In March 1860, she died 5 days after giving birth to a baby that survived for only a few days. Her husband then had her and her baby’s remains mummified. Ruth Berry was a freak show performer who was born with conjoined limbs. 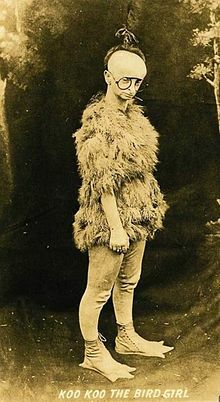 She billed herself as “Mignon the Penguin Girl”, and performed in freak shows for more than 30 years. 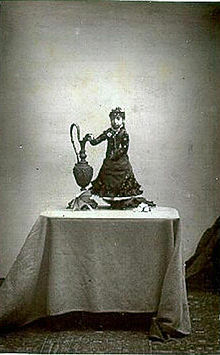 Lucia Zarate might possibly have been the lightest-weighing adult who ever lived. By the time she was 17, she weighed only 4.7 pounds and was 20 inches tall. Zarate suffered from Microcephalic osteodysplastic primordial dwarfism type II, an extremely rare type of disease that had only been classified in 1982. Prince Randian was a Hindu Guyanese who performed under names like “The Human Caterpillar” and “The Living Torso”. 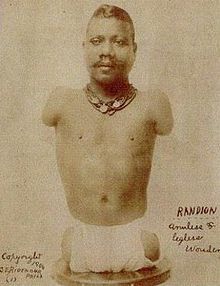 Despite having no limbs, Randian could paint, write, shave, and even light cigarettes using his mouth.